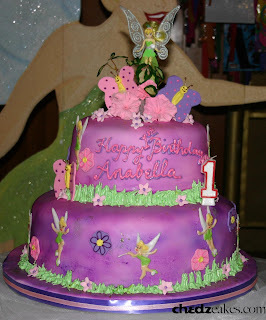 Here is the Tinkerbell cake for Anabella's first birthday (who had a joint celebration with cousin William). Covered in lavender fondant icing, it was adorned with color-flow tinkerbell figures, sugar flowers and butterflies. On top is her tinkerbell toy surrounded by sugar flowers and butterflies.